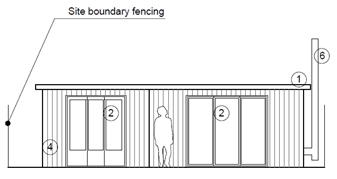 Borough of Poole: Pure Town Planning have recently obtained temporary planning consent for a residential annexe. This is annexe is needed for the client to reside in while building work on their new dwelling takes place. The client came to us after the Borough of Poole served an enforcement notice on their outbuilding being used as a residential annexe. They came to us seeking to get planning permission to regularise this through a retrospective application. However, things were not as straightforward as they first seemed. The first technicality with this application was that while the client had a Lawful Development Certificate for an outbuilding of this size and height under permitted development rights for a garden shed as they decided to build it as a residential annexe, which is not allowed under permitted development, it meant the entire building was considered to be unlawful. Further to this, as the clients have extant permission to demolish their existing main house on the site and erect a new dwelling in its place it meant that an application for a residential annexe could not be considered as it would be the only dwelling on site while the building works on the main dwelling is being undertaken. Fortunately, for the client, we managed to secure a temporary two-year consent to give them the time for their new house to be built and allow them to move in, while still living onsite. So if you are looking for a town planning consultancy who have the expertise to handle intricate cases why not get into contact either through info@puretownplanning.co.uk or 01202 585524 for a FREE 30 minute consultation.